This really shouldn’t need to be something that’s said. But, when choosing a dog coat, your primary concern should be the comfort and well-being of your dog. It’s also worth considering that while some coats may look better, with regular use they won’t hold up to a coat that’s easily washable. As dogs get older, it can be more difficult for them to go through excessive movements before they go for a walk. That can be difficult, particularly if the dog is anxious to get outside. Some dog coats are easier to put on than others, so keep this in mind before buying. While a warm winter coat may look cosy and warm, you do have to remember that smaller dogs might have a more fragile frame and the extra weight of a heavy coat is lot for their little legs to carry. Make sure your dog really needs a coat before you buying one. This is completely normal. It gives the dog more movement and allows manufacturers to make coats that suit a broad range of dogs (chest size tends to be the measurement that varies a lot from breed to breed). Do you love to take your dog on a walk? 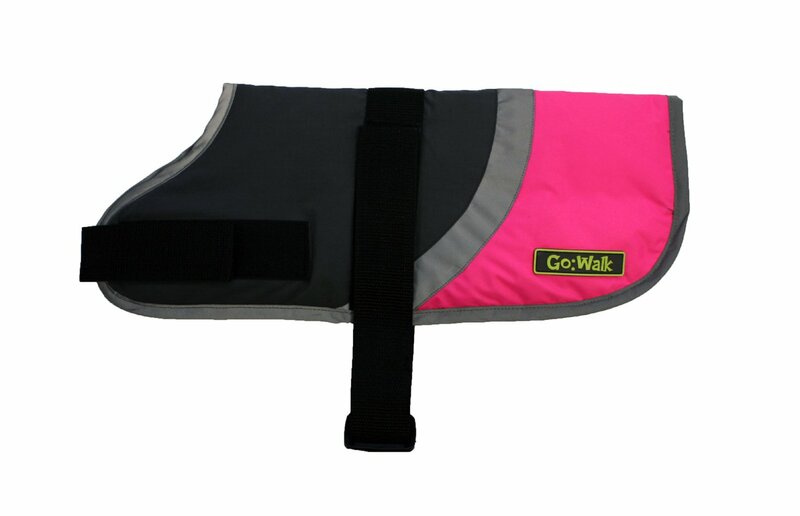 If yes, the Go Walk Hi Vis Coat should be a perfect fit for your dog regardless of the walking conditions. It’s adjustable straps and unique design adequately compensates the need for versatility and practicality. My dog “Lucy” gets twitchy and obviously excited whenever it’s time for her walk. I know it’s not because I am such a great company but because of the overwhelming feeling of freedom she gets thanks to her new Go Walk Hi Vis Coat. When Lucy is happy, I am happy as well, so it’s our favorite outdoor gear. Exactly what makes Go Walk Hi Vis Coat unique? The coat’s unique water resistant design ensures that dogs are protected and kept dry at all times during winter conditions. In fact, you could call it the “winter dog coat” and you wouldn’t be wrong. The hi visibility strips almost guarantee safety when taking a walk in any dark and wintery condition. The Go Walk Hi Vis Coat is slightly padded at relevant points to provided shape and protection when your dog gracefully takes those majestic steps down any street that you choose. The padding also helps to maintain your dog’s natural body temperature at all times. The adjustable straps ensures the coat is a perfect fit for your dog in a way that guarantees comfort and elegance. Water proof coverings to resist rain and other windy conditions. It’s premium wash at 30 degrees ensures that it is not a problem to keep it clean after every walk. Adjustable straps and secure fastenings provide the comfort your dog needs during every walk. However, sizes may differ when it comes to the full range of Go Walk coats. Leg straps are elastic as well to provide a secure fit that brings both comfort and freedom. Size variety ensures that you can choose coat sizes up to 50cm. A robust color variety and vast range of sizes to choose from makes your choices almost infinite. Go Walk HI Vis coats are unique and should fit your dog’s body structure as long you have a decent idea of the shape and body measurements. This is a great, reasonably priced and robust dog coat. It’s a perfect choice for anyone who walks their dog at night, particularly in urban areas where the high visibility material will ensure that motorists and cyclists are aware of them. As a pet owner, keeping your greyhound clean, warm and dry is essential as it contributes to their health and happiness. If you are looking for an effective way to achieve this then the Ginger Ted Showerproof Greyhound, Lurcher & Whippet dog coat is what you should be looking into. This is a unique and attractive coat that is specially designed to keep your dog dry, clean and most importantly, warm. The interior of the coat is made of polyester. The exterior of the coat is waterproof, windproof and at the same time breathable. 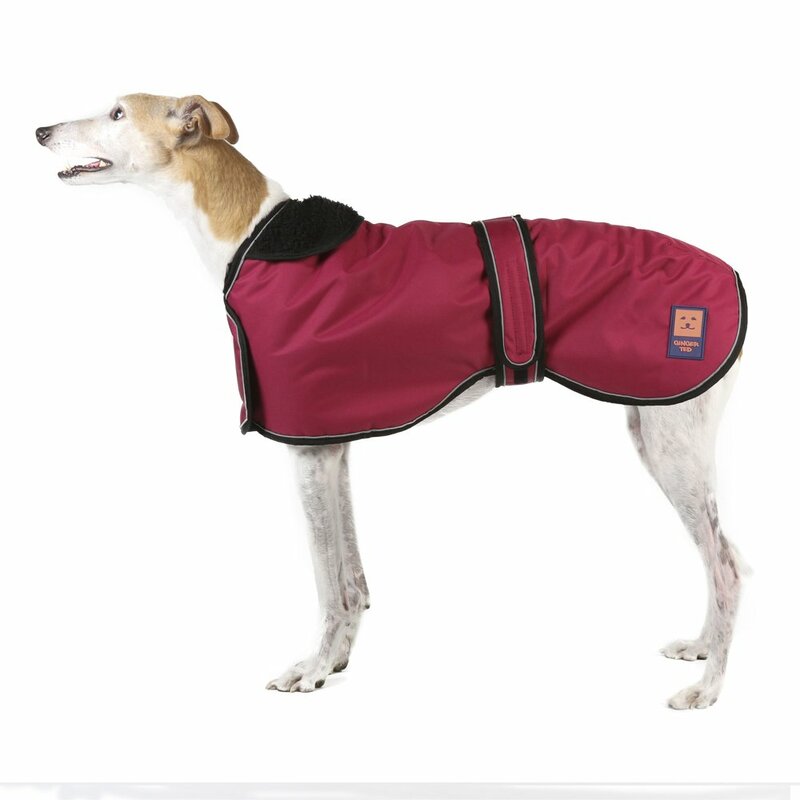 Besides these, the coat has other features which make it an ideal choice for your greyhound. Winter can be quite harsh for our little pets hence the need to improvise and add them some warmth. This jacket is well lined with a layer of warm fleece. This is guaranteed to keep your four-legged friend well comforted regardless of the freezing temperatures outside. Normally, dogs are playful animals who love to play and run around. In this case, the Ginger Ted waterproof jacket is designed with a belly strap that goes secures the jacket into place. The strap is comfortable and in no way does it harm or harshly rub against your dog’s skin. It is also adjustable which means that you can adjust it as the dog grows or even after a meal to their comfort. They can play all they want without worrying about the jacket coming undone. This coat is designed to go all the way up to your hound’s neck. This contributes to its warmth. However, when its warm outside, this can be folded back with ease. This also comes in handy if your dog has more room to grow. Unlike flat jackets, this one is designed with a contour which comfortably suits greyhounds, whippets, and lurchers. It tends to flow along with the natural contour of the dog’s body hence facilitating the dog’s comfort. The material used to make the coat is of strong and able to withstand frequent wear. It will be a long while before you need to replace the Ginger Ted Greyhound Jacket. This jacket also has quick fastening that especially comes in handy with impatient dogs. The body of the jacket is adjustable as well as the front straps. From its features and advantages, the Ginger Ted Dog Coat is a worthy purchase. The fact that the body of the jacket is specially contoured to flow with the shape of the greyhound facilitates comfort. It enables the dog to feel comfortable while in it. The adjustable straps are also a bonus as they allow the owner to adjust it as per the needs of the dog. The material is also of high quality which means that the jacket will serve you a long time before needing to be replaced. The Outhwaite Padded Tartan Dog Coat is a product that’s designed for pet lovers who prefer to keep their furry little friends warm and dry especially during the cold seasons. Unlike most products out there, this one is designed with your dog’s comfort and value for your money in mind. The coat is 100% water resistant, has a warm lining and fits different sized dogs. The strong stitching and highly comfortable material used guarantees the coat’s durability hence value for your money. Gone are the days when your dog had to shiver and whine all night long because of the biting cold. This dog jacket is designed with a warm interior lining that will trap your pup’s body heat around its skin for warmth. The Outhwaite jacket is waterproof which means that you can take the little guy out for walks without stressing over the weather. The material used is so strong that you do not have to worry about the coat tearing and leaking in water. The waterproof material also sees to it that your dog remains clean even after hours of play out in the yard. Although the material is strong, durable and waterproof, it is impressively comfortable for the little guy. It is light in weight which means that the coat will not weigh the dog down. The material is also breathable which means that the pet can keep their skin cool for comfort. To finish off the well thought off design of the coat is well-taped seams. These are well done which rules out chances of unfinished edges painfully rubbing off on the dog’s skin. 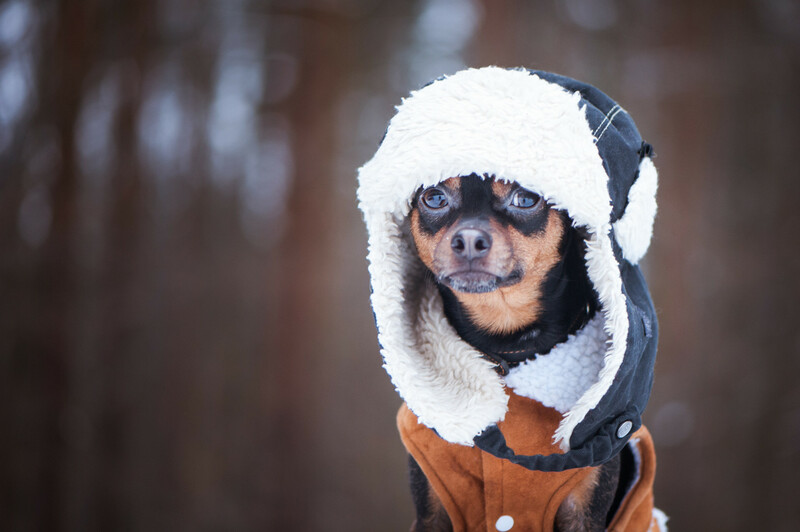 Your dog can comfortably wear the coat all day without experiencing any discomfort from the seams. 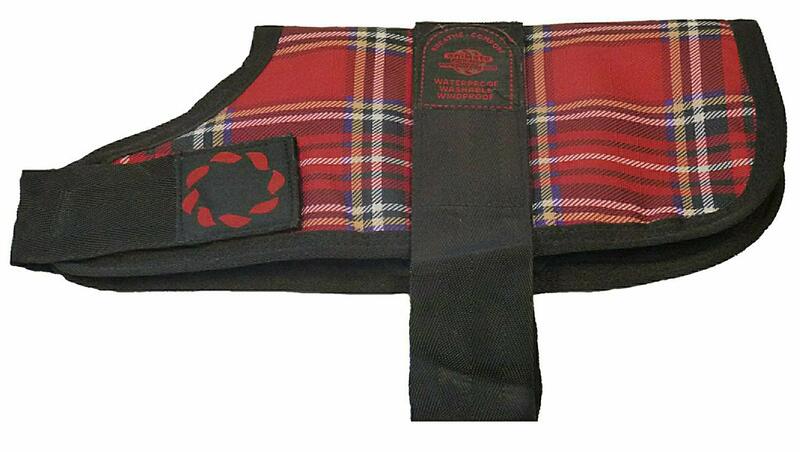 In order to keep it in place, this padded tartan dog coat comes with some efficient leg straps. It prevents the coat from rubbing against the dog’s skin which can cause irritation. These straps are in no way uncomfortable to the dog. The Outhwaite Padded Dog Coat comes with a velcro belly strap. This sees to it that the jacket fits different sized dogs comfortably. All you need to do it adjust and secure it to your dog’s comfort. This also facilitates room for growth. It means that the coat can be used even after your dog experiences a growth spurt. The Outhwaite Padded Dog Coat is great value for money. It is of high quality, comfortable for the dog, effective and durable. It well serves its intended purpose which is to keep your dog dry and warm. The fact that one size fits different sized dogs means that your dog can use the jacket for an extended period of time. In addition to this, the strong material also sees to it that the coat remains damage free. 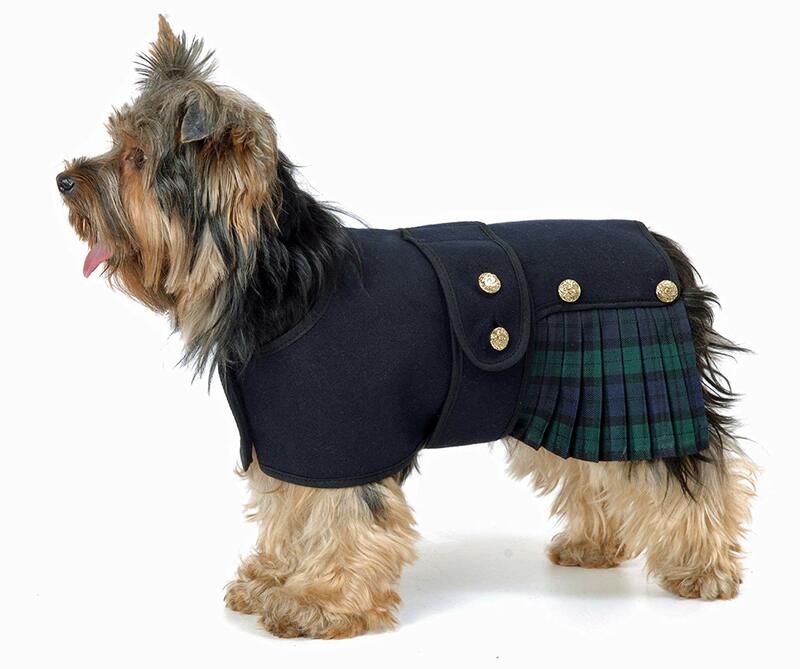 Keep your dog warm, dry and stylish with the Cosipet Cosi Kilt. Your pets deserve some tender, love and care always. Build your relationship with them by glamming them and keeping them fit like a fiddle. Ideal for use in the winter, your dog can rock this classic coat when out for a stroll. If you frequent the airport for flight travels, your dog in its jacket will catch everyone’s attention. For aesthetic purpose, you can dress your dog in this coat for weddings and other outdoor events. Comes in a classic and striking tartan that never goes out of fashion. The woollen jacket is of reasonable weight and as a heat absorber, the winter season is well taken care of. The cosipet provides enough warmth to your dog preventing ailments like flu and breathing related issues in pets. The neck area is not tight fitting and cannot cause chocking. Blending with acrylic gives an adorable result. The smoothness of the jacket is unspeakable and gives an amazing gloss. Acrylic allows for quick drying after washing. The golden gilt buttons are beautifully fixed and their brightness marvels your heart. Winter may cause mud and lots of rainy days. This coat made from a blend of wool and acrylic takes the place of a raincoat if you don’t carry one when out. Your dog’s body is protected from showers. When they roll in mud with the Cosipet Cosi Kilt, the fur around their chest, back and tummy remains as clean. Cleaning up your dog afterwards is quick. Light in weight, it doesn’t cause discomfort once worn by the dog. This aspect makes drying a quick affair. Storage space needed is little. Gently fold it and store in the pet wardrobe. It is not bulky. The traditional pleated kilt is spot on and admirable. The double coloured pleats are the first to notice. Good thing, you can hand or machine wash this cosipet cosi kilt with mild detergent to prevent the wool from getting damaged. Machine dry, iron and store in a dry place to keep the pleats intact and prevent effects from mildew and mould. Bleaching it is not advisable. Cleaning and maintenance is a breeze-no migraine. Love your pets and have them looking adorable each time. The Black Watch Cosipet Cosi Kilt provides ultimate protection to your dog. Their smooth and gorgeous fur on their torso and back area remain intact once on. Let you and your pet stand out in your friend’s wedding or any other social gathering. Winter can be harsh to our pets especially if they are too young or lack a thick coat of fur on their bodies. If too harsh, the cold can make them sick and consequently render them inactive. The Muddy Paws Stormguard Coat is specially designed to keep little dogs warm and comfortable during the cold season. This coat is designed with a combination of features which make it an ideal fleece lining coat for your little pup. This vest is designed to withstand various weather conditions. During extreme weather, you can rest assured that your pet will remain warm. The lining of the coat is designed to prevent their body heat from escaping. The coat will also keep your pet dry in case its drizzling outside. In order to keep it in place, the Muddy paws storm guard and fleece lining coat has velcro fastening straps. These are adjustable hence guaranteed to fit different sized dogs. The fastening will not only secure the coat in place but also facilitate your dog’s comfort. This product also comes with elasticated leg straps which are comfortable and do not irritate or hinder the dog’s activities. The dark fur on dogs makes them difficult to spot especially in the dark. This puts them at risk of being hit by cars or kicked by absent-minded pedestrians. The storm guard and fleece lining coat has a visible reflective edge tape that will come in handy when walking the dog or let him play at night. When it comes to dog attire, durability goes a long way. The Muddy Paws Stormguard Coat is made using a durable material that will see it serving your pup for an extended period of time. The all-weather material can withstand even harsh weather without compromising its functionality. Your dog can play in it under the sun without worrying about the coat fading. However, the most important thing about this fleece lining coat is that it is gentle to your dog and does not cause them any discomfort. The leg and neck allowance does is big enough to facilitate movement so the pup can comfortably play with the coat on. A look at the features of the Muddy Paws Stormguard Coat, it is fair to say that this coat is a worthy investment. The fact that it will keep your little furry friend warm and clean is impressive. 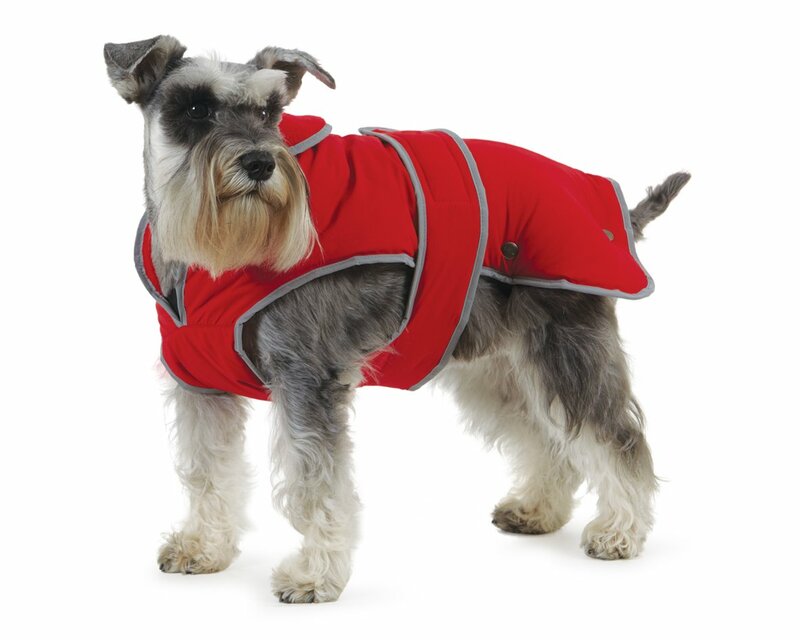 This coat is especially suitable for dogs, such as, springer spaniel and beagle which are small breeds. In order to secure their safety, this coat comes with a reflector tape all around the edges which is meant for your dog’s visibility is vital. This way, nighttime walks are rendered safe for the little fellow. The durable material is an added advantage that adds value to your money. Do you have a question about dog coats? Leave a comment below and ask the community. Is your dog uninterested in playing with your toys? Here are some tips to help encourage your dog to engage more. Most people know that owning a dog is a fun and rewarding experience. What is perhaps less well known is that owning a dog brings with it a whole host of health benefits too. They say dogs are man’s best friend and that’s the truth. Dogs are inherently social creatures and have their own array of needs and want. Let’s look at some tips for choosing the best toy for your dog. What Does Catnip Do To Cats? Why Do Cats Love Boxes? © 2019 PetToy.co.uk - Pet reviews for dogs, cats and their humans!